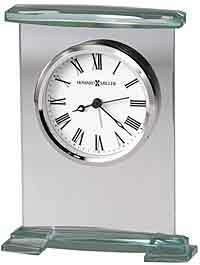 The Bulova B6215 Windswept III Sailboat Clock is a Graceful desk clock with a sailboat design. The beveled cut and polished mineral glass edges and contrasting blue foresail create a stunning look. The clock insert has a sun ray patterned satin silver bezel surrounding a white face with Arabic numbers and straight black hands. Clear silicone feet protect the hull from any surface. Requires one (LR44) battery, included. 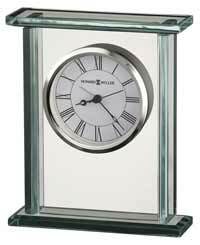 Size : Height 7.5", Width 6", Depth 1.75"
Clocks for sale at The Clock Depot including the B6215-DS at discount prices.